I spent some time playing Crusader Kings Deus Vult by Paradox Entertainment for the sake of fun as well as spying on the competition. I was close to putting the game away after spending half an hour trying to “play” it. There is no tutorial or anything to help explain things. The tooltips were helpful, but didn’t explain how all the variables influenced all the other things in the game. I finally looked at some YouTube video footage that detailed some of the basic game play. Captivating! A must for strategy game enthusiasts. 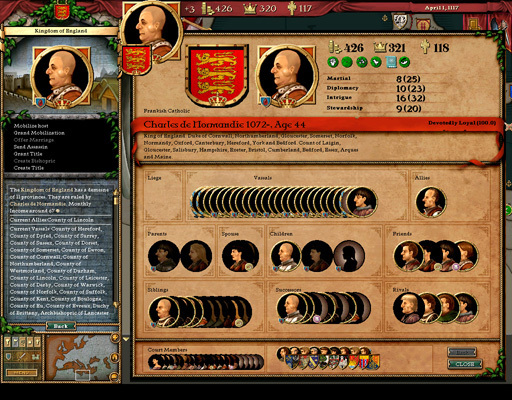 The game allows managing everything from members of your court, diplomacy, military, economy, provinces to the empire as a whole. Sophisticated diplomacy management make it both challenging and interesting to play. Endless hours of entertainment, once you get the hang of it. It’s a bargain for $25. The graphics look good enough, but the user interface is simply a pain to navigate. 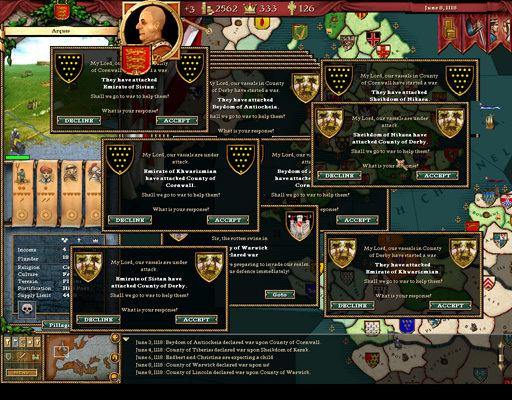 Clicking on provinces, military units and factions is difficult. There should only be one zoom level for the map. You are either too close or too far away from the map. The overview map should have the various provinces colored. Accidentally clicking a message box. Every so often just the instant before you select a province, a message pops up and you select one of the buttons by accident. Especially annoying if you just declared war against a big empire. Unclear relations between the various variables. It is difficult to manage your empire if you don’t know what all the various options do. Although the rollover texts provide some guidance many things are left unexplained. The game is definitely worth playing. A streamlined version of it could make it an exceptional game. 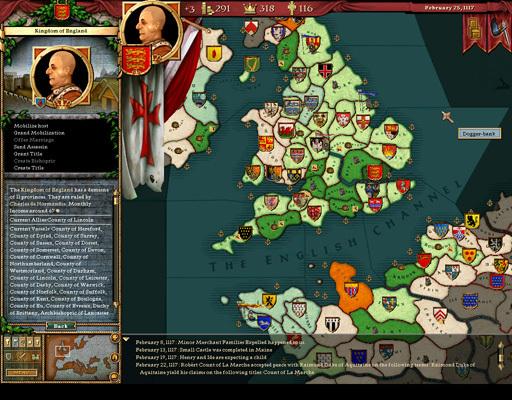 You can download the Crusader Kings through GamesGate. Get the Deus Vult edition for $25.